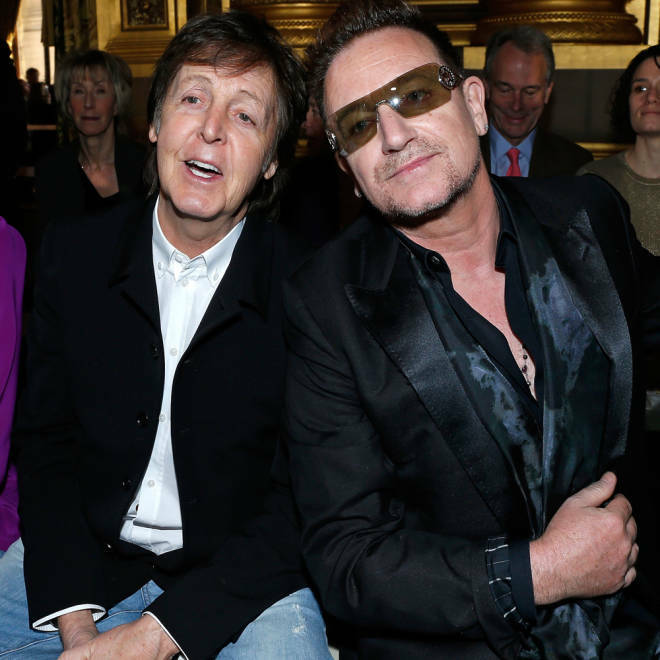 What are Bono and Paul McCartney discussing at Paris Fashion Week? We'd love to be a fly on the wall (or "The Fly," if you must) at the Paris Fashion Week event that had rock superstars Paul McCartney and Bono seated next to each other on Monday. Paul McCartney, left, and Bono in Paris on Monday. The former Beatle and the U2 frontman turned up in the front row for Stella McCartney's Fall/Winter 2013 Ready-To-Wear show. What do you think the two men chatted about? We chuckled at the prospect of Bono bumbling through a list of questions à la Chris Farley in the memorable "Saturday Night Live" skit with the late comic as a nervous talk-show host. Bono: "You remember when ... remember when you were with the Beatles?"